It can be seen at Fishers Green Sailing club. 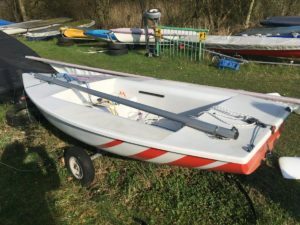 Standard complete with boat cover, folding trolley, pradle and windex, Rigged for racing with 12:1 kicker, 4:1 outhaul and 4:1 downhaul but also an ideal cruising boat that you sit in rather than on. Inspect and buy at Nantwich and Border counties SC Cheshire £499. 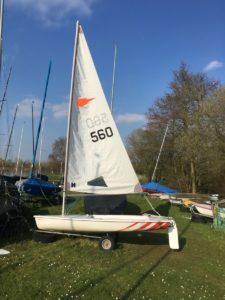 COMET XTRA, sail no 179, “Red Arrow” beautiful condition. This boat was a standard Comet, built in 1988. 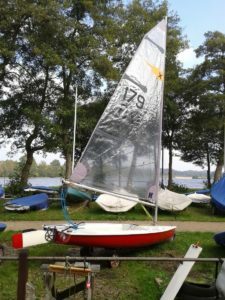 It was converted to a “Comet Xtra” in 2009, the conversion includes a shorter mast, high performance Mylar sail, with the same overall performance as the original Comet. The hull (Red with White deck) is in superb condition, hardly a mark on it. All fittings, ropes etc are in excellent condition, as is the sail. All documentation: Certificate of measurement and origin, Owners Handbook, and receipts for the Xtra conversion. I have only sailed her half a dozen times in the last 2 years, and I am selling her as I sadly have too many other commitments. Comet roof rack and ‘easiloader’ system available to collect and take away.